To ordinary people, looking into a drawer should not be something to fear. Ruth, played by Shauna MacDonald in White Chamber, is not an ordinary person, however, and she is not in an ordinary situation. Instead, she has awakened in a white cell that holds plenty of nasty surprises, which is driven home for her when she looks in a drawer that has opened in her chamber. Here's the official synopsis, which gives a little more context to the action: "The United Kingdom in the near future. Civil war rages, and martial law has been declared by a military government hellbent on squashing the opposition. "A woman (Scottish BAFTA nominee Shauna MacDonald, The Descent) wakes up in a blindingly white cuboid cell, where General Zakarian (Oded Fehr) uses increasingly sophisticated and cruel methods to torture her for information - information she claims not to have. As questions of trust are placed both on captor and captive, they find themselves embroiled in an increasingly spiraling journey into the nature of authority. "Tense, shocking, and all-too relevant, White Chamber poses the question: can there even be such a thing as certainty in these most uncertain of times?" Watch the tense clip below. 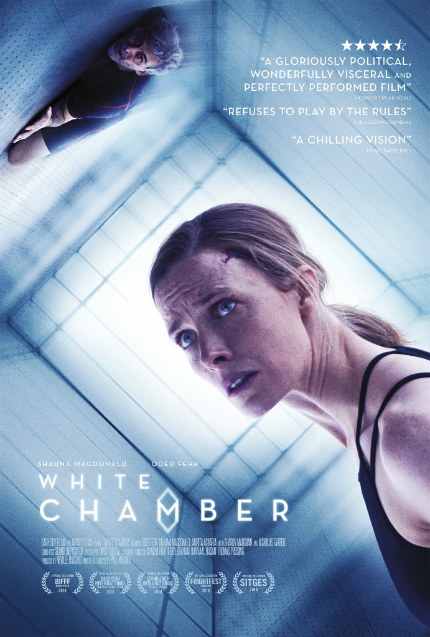 Dark Sky Films will release White Chamber in select theaters and on VOD on Friday, March 29, 2019.